You're working on your iPhone or playing an awesome game when you receive a notification. You take too long to look up from your activity, so before you get a chance to see what's up, the notification is gone. Persistent notifications won't disappear on you like the default disappearing ones in iOS 11 and iOS 12, giving you as long as you need to check them. Here's how to set them up. While persistent notification banners first made a splash in iOS 11, it's changed slightly in iOS 12 and higher. The fundamental function is still the same, so your notifications won't disappear until you dismiss them or leave an app, but enabling persistent banner alerts is now slightly different. The best way to try out this new feature is to head to the "Notifications" menu in your iPhone's Settings app. From here, you'll see a list of all apps that are capable of posting notifications. Tap an app's name to explore its notification options further. No matter if you're on iOS 11 or using iOS 12 or higher, make sure "Allow Notifications" is enabled, as well as "Banners" under the Alert section. Next, if you're on iOS 11, tap "Persistent" under the Show as Banners toggle. 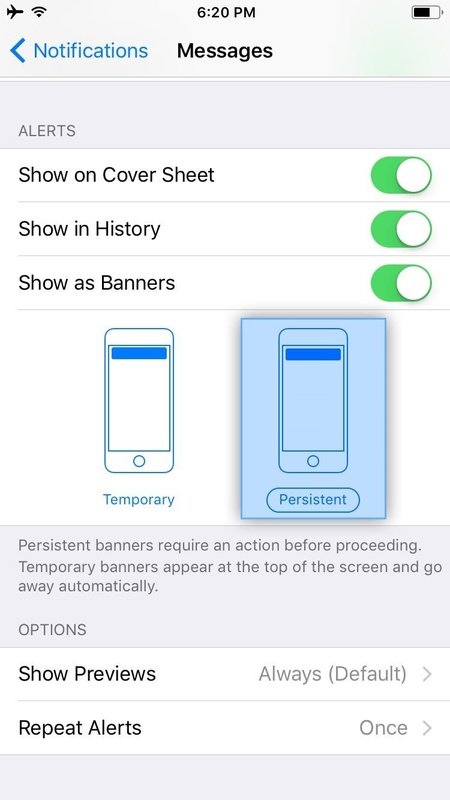 For iOS 12 and higher, tap "Banner Style," then choose "Persistent" so that banners won't go away by themselves anymore. Now, you'll just have to wait for an incoming alert to try out the new persistent notifications. They behave the same way banner notifications worked before, but with one exception: They don't disappear automatically, so you can take your time to act on them without worrying about the banner fading away. If you press your Home button, trigger Siri, lock your screen, or otherwise leave the app you were using when the alert came in, the banner will still disappear. Aside from that, the only thing that will make the banner go away is if you interact with the notification somehow. For example for an incoming iMessage, you could swipe up to dismiss it, swipe down or use 3D Touch to reply, or tap to open the message. Persistent alerts ensure you don't miss a notification on your iPhone, keeping you up to date on what's going on in your world. That said, even if you actually brush away a persistent notification, you can always head to the Notification Center to catch any missed messages, alerts, or reminders. IOS 12 ensures your notifications are clean and organized, thanks to the new grouping system.